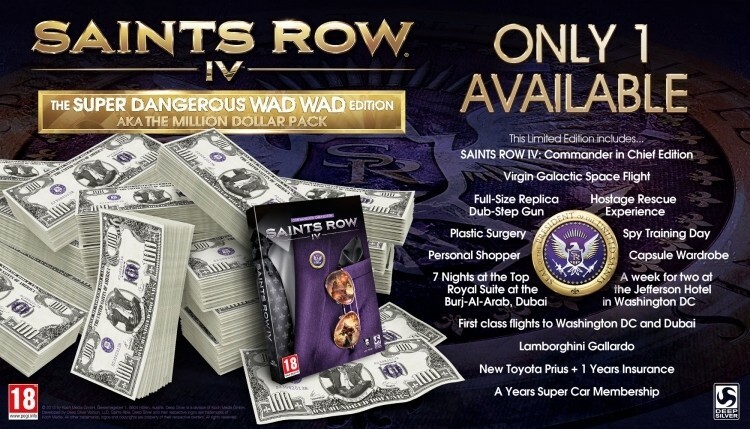 If you thought the Saints Row IV collector’s edition announced last month was over the top at $129.99, it pales in comparison to the latest bundle known as the Super Dangerous Wad Wad Edition. It’s so prestigious that only one is being created and it’ll set you back $1 million. The one-of-a-kind Super Dangerous Wad Wad Edition is perhaps more accurately described as a bundle of experiences. In addition to receiving the Commander-in-Chief edition of the game as well as a full-sized replica of the in-game Dubstep Gun, whoever is dedicated (or foolish?) enough to hand over a million bucks will get to experience a day of spy training, a hostage rescue experience and a ticket to space courtesy of Virgin Galactic’s space flight. It doesn’t end there, however, as you’ll also take home a one year membership in the E25 Super Car Club – the longest established and largest supercar club in the world – and a Lamborghini Gallardo. You’ll also get to experience seven nights for two at the Jefferson Hotel in Washington DC and seven nights for two in the Top Royal Suite at the Burj-Al-Arab in Dubai, the most prestigious and fourth tallest hotel in the world. First class airfare is provided for both trips. Publisher Deep Silver is also tossing in a shopping spree with a personal shopper, a Toyota Prius with one year of insurance for when you don’t feel like driving the Lambo, capsule wardrobe, and if you aren’t happy with your looks, plastic surgery. Just for fun, if you could pick any one perk from the list, which would you choose?